A Service Awards Program is a great way to recognize employees for their loyalty, and length of service to your organization. Select-Your-Gift offers an Employee Service Award Program that provides a level-based gift catalog so employees can select their own special gift. Service award packets include award presentation materials that can be customized with your company name and logo, the person's name, and your congratulations message. 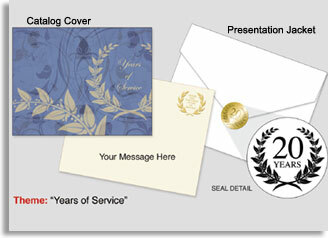 The service award catalog included with each anniversary gift package contains a large selection of life-style awards. Employees redeem their award from the provided catalog, or its online version (online they'll see almost twice as many items), selecting their own gift, which is quickly shipped right to their home (within lower 48 US). There are many tier-level packages/catalogs available that can be matched to each of your service recognition milestones. This will be helpful when choosing service awards for employees. From low-cost employee onboarding milestone gifts - starting at $20 complete, to higher level award catalogs for longer anniversaries and retirement gifts. No minimums, no contracts, and employee satisfaction is 100% guaranteed. Obviously, Employee Service Awards recognize individuals for their dedicated service to your company, but it does much more. This type of recognition is appreciated by all your employees who will plainly see that your company cares about it's people. Select-Your-Gift offers a variety of employee incentive, recognition, and gift programs with quality recognition materials and awards. These programs can help you expand and improve employee recognition experiences - and make the administrators job easier. Remember, with each Years of Service Recognition Award Package, Everything is included (see details). For practical advice and tips for starting or updating your Service Anniversary Gift program, we have prepared this helpful Guide to Employee Service Awards. It's yours Free when you contact us (click below). and we'll provide a link to immediately download this FREE eBook, plus we'll send a sample Award Presentation packet and sample catalogs.